Buffers, popularly made of different varieties of rubber, are type of any device, material, or apparatus which are used as a shield, cushion, or bumper, especially on mobile machinery, cranes, trolleys, transfer vehicles etc. They are designed basically to ensure very low impact shock to structures and considered a useful safety aid with many uses like protecting vulnerable corners. Why is Rubber the Preferred Material for Making Buffers? They are characterized by very high elasticity and tensile strength. They have high impact resistance. They also have good abrasive resistance. Some elastomers also have highest mechanical and dynamic load capacities. 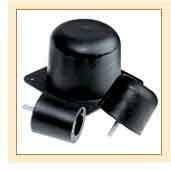 Solid rubber buffers are designed to be easily and securely fixed to walls. They can wrap around steel, absorbing impact and reduce damage to property. These wall buffers are designed to absorb impact damage in service areas, loading bays, and car parks. This type of buffer is usually placed around the edges of a trolley to prevent damage to door jambs, etc. It is actually a rubber strip fitted by pushing a metal strip along the center of the section and screwing through into the side of the trolley. This type of buffer is used to prevent damage to corridor walls. The rubber buffers are placed onto tubular legs just before the castors or wheels. When a trolley approaches a wall the buffers come in contact with the wall first and freely revolve on the tubing, thus rolling the trolley along the wall so as to prevent any damage. These buffers are fitted to new or existing trolleys with square corners. They are used to stop much of the damage to walls, door jambs, etc. The end profile of such buffers are usually matched to the 'D' section rubber strip.